26 total news articles in this section, 10 per page. What happens when you take Armada Scavenger, 2007 Movie Protoform Optimus Prime, Universe Heavy Load, Energon Megatron, Energon Landmine, Universe Dropshot, and an Armada Unicron? For customizer shenron_customs, you get the Pre-Earth combining behemoth, War For Cybertron Devastator. While Devastator has been a center piece for a couple of third parties, this custom is also a piece of art for the sheer amount of scratch work put into it. 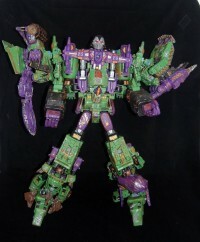 Deco'd in the traditional green and purple, and decked out with tons of battle damage, check out Scavanger, Mixmaster, Hook, Long Haul, Scrapper, Bonecruaher, and the combined Devastator below! Share your customs with us in our Transtopia forums! Before Transformers, there was Diaclone. In the early 80's, the Insector Robo were released in Takara's Diaclone line well before the birth of Transformers. Then in 2004, the colors were thrust upon the world through an e-Hobby exclusive set. Now Salvo, Shothole and Zaptrap make their way into the year 2011 thanks to customizer xaviercal and his work on FansProject's Casuality 03-05. Decked out in bright red, check it out below! Share your custom work with us in Transtopia! Not all great Transformers come in the form of plastic! 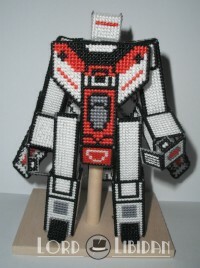 As Lord Libidan, master of stiching, teaches us, Transformers comes in all shapes and patterns. 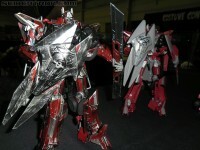 Not only has he stitched up fan-favorites Autobots, Optimus Prime and Jetfire, he's made them 3D. Hey, not only that, but the stiched up Transformers are actually Transformers, as you'll see Optimus and Jetfire in their truck and jet alternate modes. Talk about creativity. Check them out below! The classy customizer eNcliNe desigNs was back at the main show, showcasing a ton of his projects. Of note, he's got his custom Leader Shockwave on display, a scratch-built Generation One Optimus Prime with over 70+ points of articulation, and a pimped out Revoltech Optimus Prime. Check it all out below! All of eNcliNe desigNs' customs can be found in his event page, which will be updated shortly! Customizer eNcliNe desigNs may not be a third party, but the artist was able to make it to Victoria, Canada for Cherry Bomb Toys' 8th Ultimate Hobby and Toy Fair! He brought along with him a bunch of his custom pieces, including a custom Leader Shockwave, battle-damaged Sentinel Prime, and Breast Cancer awareness Optimus Prime. Check out the masterpieces out below! Another tidbit regarding eNcliNe desigNs, as he'll be combining his efforts with garage kit maker Renderform and third party Mastermind Creations to produce a figure that will likely please many fans. Stay tuned to Seibertron.com's event galleries for more of eNcliNe's figures on showcase tomorrow! Not happy about the 'regular' Nascar Human Alliance Leadfoot? Wish the figure had more punch to it? Customiser and Seibertron.com member tommy t is thinking on the same brainwave as you and decided to give the newly released figure some love. The figure's decked with an arsenal of weapons and a top notch paint-job, and most important, not out of place with the gunslinging and armored up Human Alliance Roadbuster. Check out the custom below! Transformers: Animated Season 4 may never have happened, but that's not going to stop fans from making it happen in toy form. 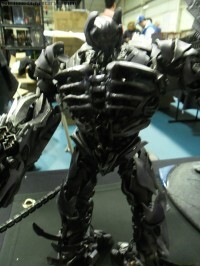 Seibertron.com member and customizer astig was able to take a Deluxe Sentinel Prime and turn it into Ironhide. His earth mode was featured in the Allspark Almanac 2, and astig did a ton of work to get it done. It certainly gives the Cybertronian version a run for it's money. Check it out below! Share your customs with us in Transtopia! The Transformers: Prime toy line is yet to be released, and there has still been no word on the release of a certain character, Airachnid. The femme fatale and villainess of the show gets some appreciation from Seibertron.com member and customizer gregles. 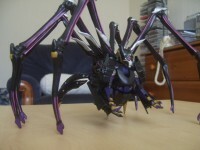 This Airachnid is a Duocon, with her helicopter alternate mode containing her major body, while her spider legs then form into a spider. Combined, you get the lethal Decepticon. Take a look at her below (as well as gregles' custom Knock Out and Breakdown), but beware her bite! Share your customs with us in our forums! 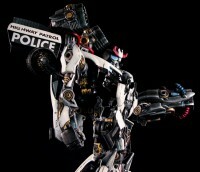 Even though he was featured heavily in the Movie prequel comics, Prowl never ended up getting a Transformers movie toy. That changes now, well at least for kitbasher and Seibertron.com member autobotx23. He's taken a chassis of a Leader Class Bumblebee, and certainly has turned it into something else. Enjoy. If the figure interests you, you'll find it on Ebay. More images of the figure can be found here. Remember to share your customs with us in the Transtopia forums! With the Masterpiece Rodimus mold getting much spotlight with the Hasbro SDCC/TRU exclusive version, soon to be released updated Takara version and upcoming Black Rodimus Convoy release, let's take a look at a custom from the 9th Masterpiece figure. 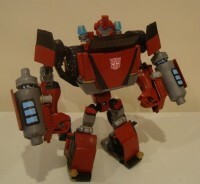 Seibertron.com member GetRightRobot puts the figure to use in ways unimaginable, turning Rodimus Convoy into the Autobot super spy, Punch. Wait, there's more! Punch even turns into the diabolical Decepticon, Counterpunch. Who would have known?